Spa Controls, also referred to as Spa Paks, are available in Mechanical (or Pneumatic) and Electronic (or Digital) versions. 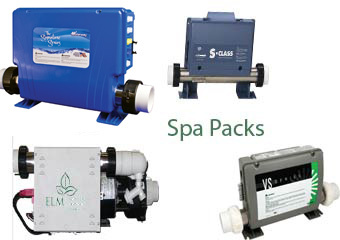 Mechanical Spa Paks have been used since the early days of spa building. In these earlier spas, pressing an air button pushes a pulse of air through a tube to an air switch located inside the control pack which then turns a function on or off. PC board (printed circuit board) with software that controls the individual spa component functions electronically. ELM carries all of the major brands of spa controls including Balboa, Gecko, CTI, ELM, ACC, Hydro-Quip, Brett Aqualine, Spa Builders, and the new Waterway Signature. Get the complete ELM Spa Product Catalogue which contains more details on our full line of spa packs including Balboa Spa paks, PC boards and control panels, Gecko spa packs, circuit boards and topside control panels as well as Waterway Signature series complete spa packs and control panel packages. A hot tub pack is made up of the components that run your spa - from electronics with circuit board, heater and controls to pump and blower. The circuit board and electronics case is often referred to as a spa pak. Spa packs come in a wide variety of assortments and configurations including 110 volt or 220 volt systems. There are also different heater sizes and voltages, various pump HP, speed and frame configurations and additional options. When replacing spa packs and components, knowing the plumbing size of the system pipe is important. The plumbing dimensions are measured by Inside Diameter (I.D.) which is usually either 1.5 inch or 2.0 inch plumbing. ELM stocks a wide variety of spa packs such as CTI Hydro Pak, Balboa VS series, Balboa Heat Jacket system, Gecko Aeware series (Gecko IN.XE, Gecko IN.XM), Gecko S-Class, Gecko M-Class, Gecko T-Class, Gecko SC-MP, Gecko SSPA, Gecko MC-MP, Gecko MSPA, Spa Builders LX-05, Spa Builders LX-10, Spa Builders LX-15, Brett Aqualine BL-70, Brett Aqualine BL-45, Waterway Signature Series. Spa controls, also called Spa Controllers, Topside Panels, or Topside Control Panels, generally come in two versions: - electro-pneumatic (a combination of air buttons and an electronic thermostat mounted in a topside panel) which is used with what is referred to as a Mechanical Spa Pak or Mechanical Spa Control - digital-electronic which is a fully electronic spa controller used with an Electronic Spa Pak or Electronic Spa Control. 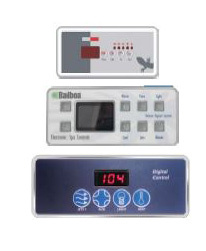 Topside spa control panels by Balboa, Len Gordon, Gecko, CTI-Mini Max, CTI-Digital Signetic, Tecmark and additional brands are available for immediate shipping across Canada. Spa side controls are available with overlay sticker, panel adapters or gaskets. Electronic control systems feature topside spa controls with push-button keypads and digital readout displays. Diagnostics and error messages are found on these type of topside controls that alert the spa owner to problems with the spa. For example, error messages such as OH- overheat will alert bathers to avoid the water as it is too hot indicating there may be a technical issue that requires further troubleshooting. 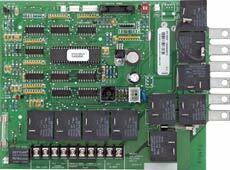 Hot tub circuit boards are pc boards that control the operation and functions of the entire spa. Newer systems have relays, fuses, circuitry and jumpers or dip-switches that allow the modification of the on-board programming. Replacement circuit boards need to be matched to existing systems to assure compatibility with all of the spa components and the topside control.